Coverage:Live commentary on Radio 5 live sports extra and Radio Ulster FM, the BBC Sport website and BBC Sport app, with live text commentary online. 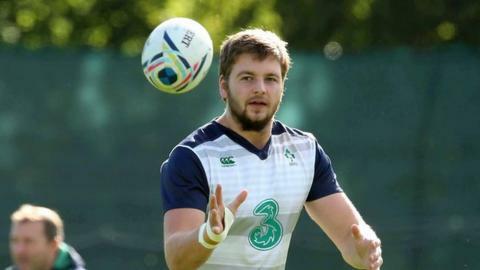 Iain Henderson says being paired with Paul O'Connell in the second row for Ireland's World Cup opener against Canada on Saturday is a "massive boost" to his confidence. Ireland coach Joe Schmidt has preferred the versatile Henderson to Devin Toner - O'Connell's regular second-row partner over the past two seasons. Former Ulster star Stephen Ferris called for Henderson to be named in the back row but the 23-year-old says he is "over the moon" to be selected at lock for the Cardiff contest. "To get starting alongside Paul O'Connell is a big, big boost for me," added Henderson. "I do feel comfortable with Paul in there and I'm sure I'll feel more comfortable as the World Cup goes on." Both Schmidt and his predecessor Declan Kidney have predominantly used the 19-times capped Henderson as an impact substitute since the Ulsterman's debut against South Africa three years ago. However, Henderson's dynamic performances in a somewhat misfiring Ireland team during the recent World Cup warm-up matches led to something of a clamour for his inclusion in Saturday's Millennium Stadium contest. "I was happy with how my pre-season went and delighted that Joe had the confidence in me," added the Ulster forward. "I played in both the recent warm-up games against Wales in the second row and I felt comfortable in both those matches. "Obviously towards the end of last season for Ulster, I was playing at number six but it's two different squads with different personnel so the coaches have different needs for the team so I will leave it to them to decide where I play my rugby." Henderson says steady work with Ulster strength and conditioning coaches Jonny Davis and Kevin Geary over recent seasons has significantly aided his development. "Where I am at now is an accumulation of what Kev Geary and Jonny Davis have been doing with me at Ulster over the past three years which included the period of rehab when I had the hip injury. "At the start of last season I was injured for quite a bit of time so had I been thrown in at the deep end and started any of those Six Nations games last spring I think I would have been blowing a wee bit. "I was happy enough just to get more experience and more game time with Ireland at that stage." Like all Ireland's personnel this week, Henderson was on message on Friday about the challenge that will be posed by a Canadian team that includes Clermont star Jamie Cudmore and Wales-based wings Jeff Hassler and DTH Van Der Merwe. However, Ireland fans will expect Henderson to be a factor at this year's World Cup for a lot longer than the Canadians.